Sounds good... Has it released world over or is it being shown across festivals alone? Has only been released in Spain so far. Will open in the U.S. late this year/early next year. And it will slowly make itself available throughout the world after that. This man personally ordered the execution of hundred of cuban from a list provided to him by the kgb. oh yeah, with no trial, no charges filed. the bodies were never returned to thier families. Ever. This man deservs only to be remembered as an enemy of freedom. all you rocker poseur kids out there would do well to research the fact that that communist assasin had thousands of young cubans imprisoned for YEARS just for the heinous crime of possesing a beatles album. I wonder if this ssuppresion of cultural icons is even slightly hinted at in the film. HEY KIDS, WANT TO GET TO KNOW THE REAL CHE? Mr sonderbug, it is acceptable and even commendable to produce films on controversial subject matter, but sir, propegating the lie that this man was anything but a freedom-hating totalitarian thug is an insult to the intellegnce of anyone with even a cursory knowlege of the historical facts. If you choose such men as your idols, you yourself, mr. millionare-communist lover, the cont oractions of your nature should be tearing your soul apart. 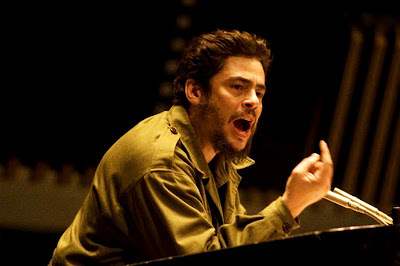 I think you'll be satisfied to know that Soderbergh is in complete agreement with you regarding Guevara. He explains his position on Guevara and his ideology pretty thoroughly in a subsequent post I put up here. Wow! I'm so glad to finally see a movie about a great revolutionary. Its a bit confusing to have two versions of the film though. I Hyped Che on Everhype and gave it 94% which I think is fairly accurate. "Wow! I'm so glad to finally see a movie about a great revolutionary." I have to take issue with your assertion that he was a great revolutionary. If anything, the mopvie demonstrates that he had feet of clay, and was undone by his own hubris. Che bought into his own hype a little too much.